Would you like to fill up your bar stools during off-peak periods? Or guarantee a packed house during the big game? A start-up company out of Boston is offering a service they say is similar to OpenTable but for bar stools. Knowing the frustrations of being a guy who just wants to find an empty bar stool at the bar, Manning came up with the idea of using an app to reserve a stool before arriving at the bar. SnagaStool shares the premium snag profits with the bar in a 50/50 split and is currently working out other “bundle” packaging opportunities to entice more bars to accept stool reservations. In addition to stool reservations, they are experimenting with offering pre-sale “tickets” during premium time slots (e.g., championship games), bundling a stool with meal packages (i.e., reserve your stool…and burger, too! ), as well as allowing the bar to offer special promotions (e.g., half off appetizer) during the off-peak times. “I worked in the bartending industry for years and designed the service to improve the interaction between bartender and customer,” says Manning. Bars simply put the SnagaStool tent on the stools that can be reserved or are waiting for their reservation to show up. Then, people who have a stool reservation just check in with the bartender by showing the confirmation on their mobile device, and the bartender shows them their stools! Bars in Massachusetts and Florida are already participating, and SnagaStool is signing up new bar partners to join in on this service. 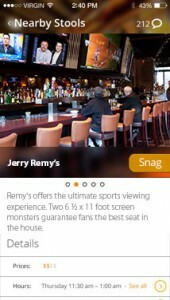 If you’re a bar interested in running promotions to your customer base using SnagaStool, visit them online at SnagaStool.com.